In our continuing series on easy Portland getaways, we have a look at a fairly easy trip that’s only a few hours away – Lincoln City. You don’t have to own a beach house to enjoy the Oregon coast. Using services like Vacation Rental By Owner or Home Away, it’s easy to book a few nights at a beach house. We picked a house that could accommodate a family of five and a dog. It’s surprising how many of the options available are pet friendly. The house was situated just up the street from Bella Beach in Lincoln City (just north of the 101 near a big Safeway, Bi Mart and Grocery Outlet). Bella Beach is a nice size and access to the beach is pretty easy, so there’s less of a need to stay right on the beach. When looking at activities in, near, and around Lincoln City, I was surprised at the lack of feedback and reviews online. After calling around to several charter fishing companies, I narrowed it down to two options, Yaquina Bay Charters (541-265-6800) in Newport and Dockside Charters (541-765-2545) in Depoe Bay. I liked how both companies presented themselves online and over the phone, and both had positive ratings among the limited reviews out there. We ultimately went with Dockside Charters because Depoe Bay was closer and Yaquina Bay Charters was all booked up for their bottom fishing trips. It’s a good idea to book these trips at least a week in advance to ensure a spot. Dockside Charters runs daily 5-hour bottom fishing trips from Depoe Bay. They charge $75 for the trip for adults and only $35 for children 9 and under. I went with my two oldest children (ages 9 and 11) and they gave my older child the discounted rate. Leaving at 6am for a fishing trip (we had to be at the dock by 5:30) may sound challenging, but the waters on the Oregon coast can get rough and the earlier trip tends to have calmer seas. A fishing license is needed for any fisherman over the age of 14 and Dockside sells a day license for $16.50. You can add crabbing to the trip with a $7 license and $15 for the traps to the charter company. The boat’s crab catch is split between all the people going crabbing and they drop one pot per participant, so it can add up to a LOT of crabs. 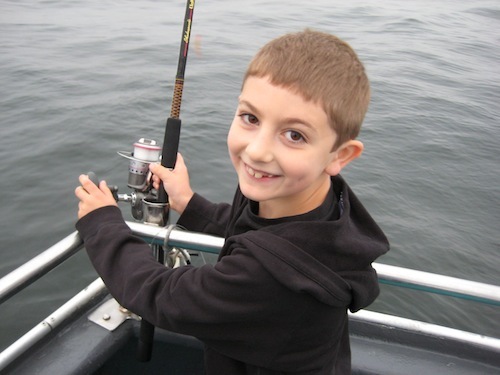 We went with bottom fishing (which includes mainly rockfish, sea bass, and ling cod) as it’s the trip with the most ‘action’, best suited for kids or less experienced fishermen. Between the three of us our limit was a whopping 21 rock fish and 6 ling cod (our catch ended up being close to limit in rock fish but no ling cod). The ship we went out on from Dockside was a 50-foot boat with about sixteen total people aboard. The boat never felt cramped and I think the experience was more fun than going out on a smaller six-person boat. Even though the seas were very calm many people (including my kids) got seasick. Sea Bands (which activate pressure points to alleviate seasickness) and NOT drinking coffee before the trip probably would have really helped. The Dockside crew was friendly and helpful and assisted in bringing the fish on board after we reeled them in. They were also great about helping the kids with their fishing and were supportive of the people who got seasick. At the dock there are people who will clean and fillet the catch (they charge $1 a fish). Since they are independent of the charters they are paid directly and in cash. Not far south from Lincoln City is Siletz Bay and the Siletz River. 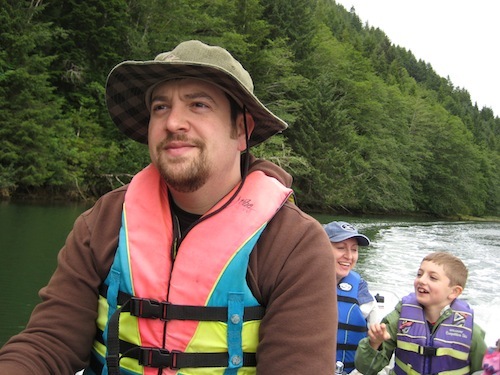 While the bay is pretty shallow and not really navigable by motor boat, the connecting river is an excellent place to boat and fish for salmon. The river also connects to an estuary which can be explored by kayak. Where the river and bay connect is the charming Siletz Moorage (541-996-3671), run by Larry and Belinda. Siletz Moorage rents out a wide array of boats and kayaks. Our timing was poor for salmon fishing as the blueback season had ended and the steelhead season was just about to start, so we decided to focus less on fishing and more on boating. We rented a 15’ SmokerCraft boat which rents out for $100 for 4 hours or $150 for 8. The boat easily fit the five of us and was easy to maneuver, even for a first time boater. The Siletz River is a wonderful mellow river that is lined by small docks and waterfront RVs. We spent four hours boating down and back the river, stopping occasionally to take in the river’s wildlife or have a bite to eat. Although it wasn’t as action packed as our bottom fishing trip, the river trip was one of the highlights of our time in Lincoln City. Although we’re not huge fishermen, we kept with the fishing theme of this trip and spent our third day at Devils Lake, which is just minutes south of Lincoln City. We had considered renting a boat from Blue Heron Landing (541-994-4708), which rents paddle boats, fishing boats and jet skis, but decided instead to stick to dry land for our fishing. 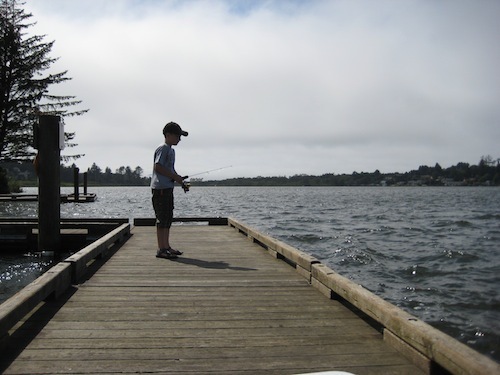 Devils Lake is stocked each year with 30,000 rainbow trout and all you need to fish there is a fishing license which can be easily picked up at the Lincoln City Bi-Mart. There are several landings from which you can fish from at Devils Lake. We chose one up the road from Lincoln City’s Tanger Outlet Mall. While it was amazingly picturesque, we were less than lucky with the fish that day. In between our main activities we spent a good amount of time just walking along Bella Beach. Unlike Gearhart or Seaside, in the north part of the Oregon Coast, there are no cars allowed on the beach in Lincoln City and this makes for a much more relaxed beach environment. 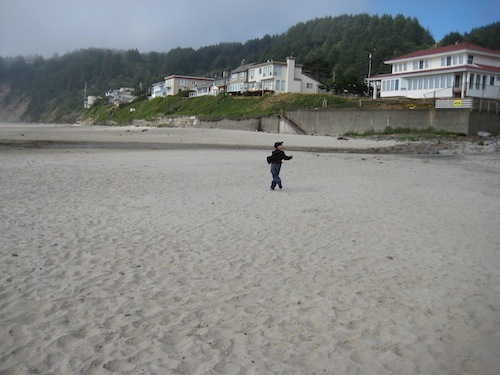 The Oregon Coast beaches aren’t the kind of beaches you sit and sun yourself on; between the generally overcast sky and the strong winds, the beaches are perfect for kite flying, taking a walk or playing in the sand. Our getaway to Lincoln City was a great reminder of all the amazing activities available near Portland. This excursion really inspired us to hop in the car and explore more activities and sights that are a short car ride away. We hope to bring you more reporting of these getaways soon. We would like to post your entire article on our website. Linking to your blog of course. EXCELLENT and ACCURATE article…You "showcased" that Central OR Coast area quite well. We're glad you liked it. Unfortunately we generally don't permit reprints of our articles. Thanks for the info and for visiting our site. We will have to check that site out before our next trip to Devils Lake. A very beautiful place. When I see you and your child. Makes me wish to visit that many other families.